In 1981 I bought the first mass marketed bike called the Stumpjumper. It had a heavy steel frame with no suspension, 15 speed top mounted friction shifters, cantilever brakes, and silly narrow tires that were considered wide "knobbies" in the day. The Stumpjumper was a great bike at the time. 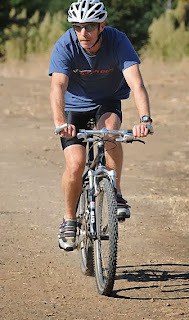 It was faster than a one speed cruiser or a Schwinn 10 speed on the dirt. The long wheelbase gave the bike directional stability on the downhills and the brakes were good enough, except when they got wet. I did my first trail riding in Marin County where I lived. Marin's trails aren't that rocky, so the ride seemed smooth. 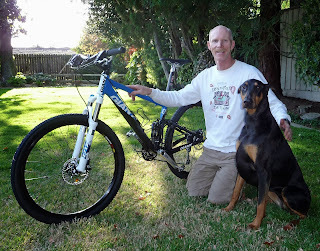 I moved to Sacramento in the mid 80's and began to ride with a group of triathletes. 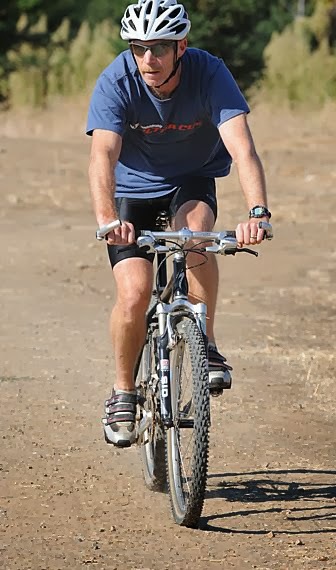 Our winter training was often on our mountain bikes on the Folsom and Auburn trails. We set our mountain bikes up with a low and forward riding position to stay aerodynamic. We also cut the handlebars narrower and added bar-ends to improve leverage for climbing. We flew over the handlebars pretty often on steep descents, so maybe we were too far over the front wheel. It was an extra bummer when you forgot to loosen the straps on your toeclips and your feet stayed stuck to the pedals. Clipless pedals were a nice invention that came later. When the first popular front shock called "Mag 21" came out, we all had to get one. The Mag 21 had less than 2 inches of travel and was only effective on big hits. It did nothing on small bumps or gravel. We did even more flying over the handlebars on descents because the shock would compress, putting us even further and lower over the front wheel. Now I don't fly over the handlebars. Suspension forks continued to evolve with longer travel and a smoother feel. As the forks got better and the speeds got faster, it became obvious that the brakes weren't good enough anymore. Shimano came out with the "V-Brake" to fix the stopping problem. Braking with V-Brakes became a two finger affair, rather than the full hand-grab the cantilever brakes required. The wet weather performance was much better as well. Manufacturers began to add more gears and indexed shifting to make it easier to get in the right gear. They ramped and angled the teeth on the sprockets so you could actually shift with some pressure on the pedals; something you could never do on the old friction systems. My next mountain bike was a 1988 Stumpjumper. This bike had an aluminum frame (Metal Matrix they called it) with fairly wide knobby tires and a suspension fork with over 2 inches of travel. This bike was fast! I still set the bike up with a low and forward riding position so I was still doing plenty of "endos" (over the handlebars) on rocky descents. The next big thing in mountain bike development was a shock for the back wheel. The early designs were heavy and inefficient. I wasn't interested in getting one of these early overweight and power-robbing designs. As the downhill speeds with full suspension bikes increased, it became apparent that V-Brakes weren't effective enough. The next big thing for mountain bikes was the disc brake. The early discs were heavy, noisy, and dragged on the wheel, but they were way better at stopping. The modern disc brake allows quicker stops with just one finger and is unaffected by water. Fast forward 25 years on the same trails on a modern bike that has better brakes, better suspension, better shifting, better traction, and I believe I really am riding faster. Oh yea, the modern riding position is more upright and back, so endos are a thing of the past! As a runner we always say; "The older I get the faster I was". In mountain biking that isn't so true.